A painter, sculptor, and installation artist, María Brito is best known for intricate mixed-media constructions that embody narratives of displacement and loss. A member of the Miami Generation, a group of Cuban-born Americans artists who emerged in the late 1970s, Brito employs a personal iconography inspired by her identity as a woman, a mother, a Cuban exile, a naturalized American, and a Catholic. Her works include large complex installations, self-portraits dense with symbolism, and clay sculptures that combine allegory and caricature in a wry critique of art, politics, and everyday life. Each is an autobiographical statement situated within the artist’s profound fluency in the history of Western art. 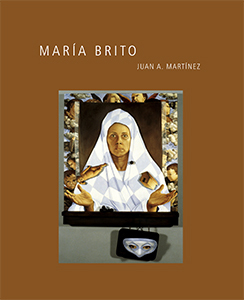 Juan A. Martínez, who focuses on Brito’s unique interplay of the personal and the universal, highlights her as an artist who challenges cultural, social, and artistic barriers. "This richly illustrated study elucidates the allegorical power of Brito’s artworks as relentless visual interrogations of modernity’s contradictions. Martínez moves fluidly through sensitive historical analyses of her exile from Cuba, her artistic formation in Miami, and her sophisticated appropriation of popular Catholic iconography and domestic materials. Brito’s works provoke us into an inquiry into the nature of human subjectivity." "In María Brito, Juan Martínez presents a lucid consideration of one of the foremost artists of the Cuban-American experience. Through careful analysis of her installations, sculptures, and paintings, Martínez reveals the longing for identity and what he defines as “a will to allegory.” The prose is refreshingly clear, as is the author’s respect not only for the artist but also for the works of art in and of themselves." "Through his careful assessment of Brito’s oeuvre, Martínez weaves a compelling narrative whose relevance extends beyond her particular work. He convincingly argues for Brito’s recognition as an American artist, and in so doing advocates for a more plural understanding of 'American' art." "This comprehensive and insightful text explores Brito’s world of magical beauty, filled with fears and desires. Juan Martínez reveals not only Brito’s life and career but also her valiant and spirited art, introducing us to her maze of rooms, the all-seeing eye filled with tears, the caprichos of her personal and cultural mythology."